The context of the problem is a business that makes hats, both by machine and by hand. 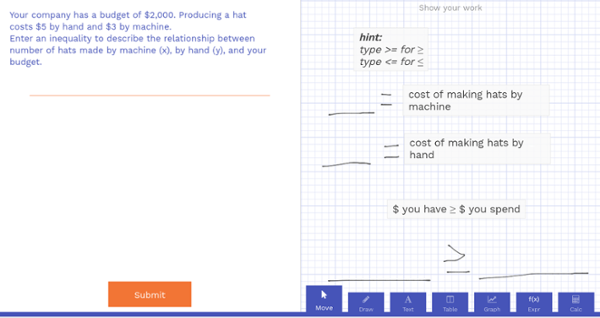 In the first problem, students need to model an inequality between their budget, $2000, and the cost of making each type of hat. Often students don’t know where to start with word problems, so this task provides some supports in the scratchpad. If you think your students don’t need the extra support, feel free to remove it by clicking on scratchpad settings after you have copied the task into your account. Notice how the scratchpad helped the student get started with writing down what they know, then putting it together to solve the problem. If students write the final answer as y/(y+x)>0.5 (or any variation of it) they will get it right, make sure you go over that this is the same as y>x before the next problem. This is a great example of how you can spice up a multiple choice question. There is a pre-made graph and a blank table on the scratchpad to help them connect different representations of y>x. This problem has the inequality from task 3 on the scratchpad. The major advantage of this is even if your students got it wrong in task 3, they won’t be building off a mistake moving forward. If you are running a teacher led poll, they won’t be able to look ahead. This task is harder than the last one, remember to remind them to use a table or plot some points. If you want, you can always add hints on the scratchpad by going to “Scratchpad Setting” when editing the task. The final problem gives them practice with testing points in a system of inequalities while remembering the parameters of the original problem. Students are given a graph of the system of inequalities to help them draw connections between different representations. Remind them as they work that they can draw on the graph (using the scratchpad) to plot points and see which of the shaded regions they are in. 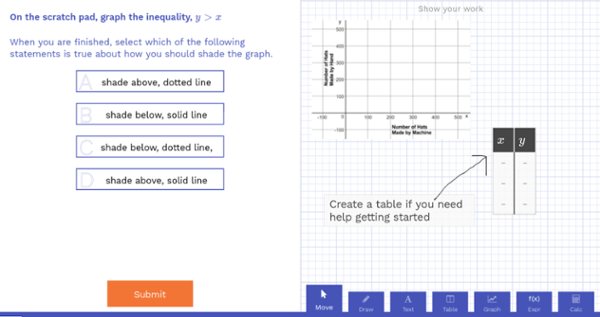 Get started by previewing the poll right now, or login to wootmath.com and search for Systems of Inequality in the Shared Gallery. Visit the page on Formative Assessment for more information on implementing these strategies in your classroom. Weekly Math Poll – Woot Math Can Do That?! Even if you remember a childhood song for all fifty states, can you locate them all on a map? 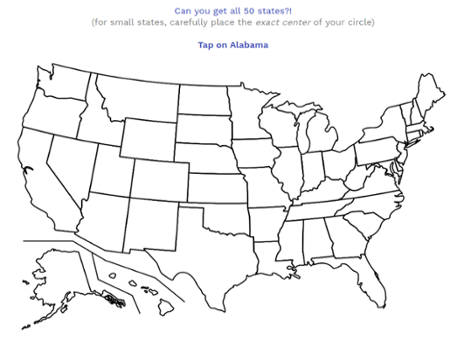 Mr. Ward created fifty different “tap” tasks to help students identify the locations of all fifty states. The “tap” feature is limitless, interactive and fun, and students love clicking on the correct answer and seeing their classmates answers appear as well. This is what the students see on their devices. Students catch onto the “tap” function extremely quickly. And it works great on tablets, smartphones and computers! In this case, you could even do it as a classroom activity by projecting it on your smartboard. On a computer, students will use the mouse to “tap” and then press submit. And on a tablet or smartphone, students just physically “tap” with their finger and press submit. Once everyone has submitted their answer, you can press “Show Results” to display the classroom results. You can choose to display the results in two ways. First, you can show all of the student responses, but choose to hide the correct and incorrect answers. To hide the results, just uncheck the “Reveal Answer” button (located on the bottom right of the screen). The blue dots indicate the student responses – now let the great group discussions begin! 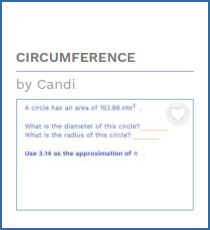 To display the correct and incorrect answers, click on the “Reveal Answer” button. 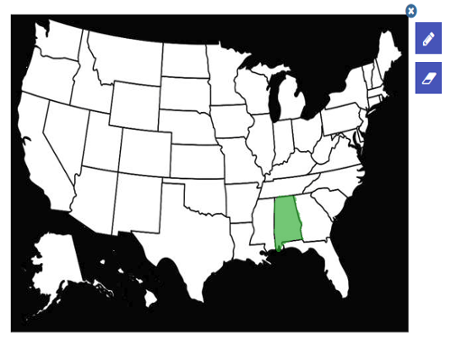 The green dots mean “correct” and red dots mean “incorrect.” In this case, two students picked the states next to Alabama, common mistake! As the teacher, how and when you share the results with the class is up to you. In the projected view, student names are not displayed, so everyone in the class can comfortably participate in the conversation without feeling the pressure to get the “correct answer”. Offline, you can analyze the results and see individual student responses (by question, by student, etc). Calling all teachers of history, language arts, science, computer science, art history and many more! We would love to see how you utilize Woot Math in your classroom! (Note that there are already lots of Physics and Computer Science questions also in Woot Math. Check out the gallery for lots more examples.) Show us your best polls with your most engaging tasks! We are all eyes and ears! Thanks for the idea Mr. Ward. 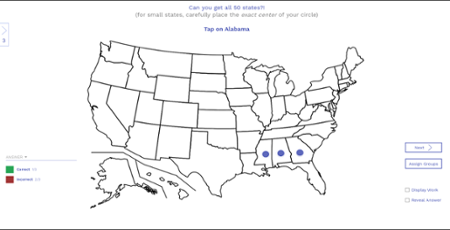 Get started by previewing the poll right now, or login to wootmath.com and search for Geography in the Shared Gallery. We’ve highlighed just a few fun questions. How would your students do on these? 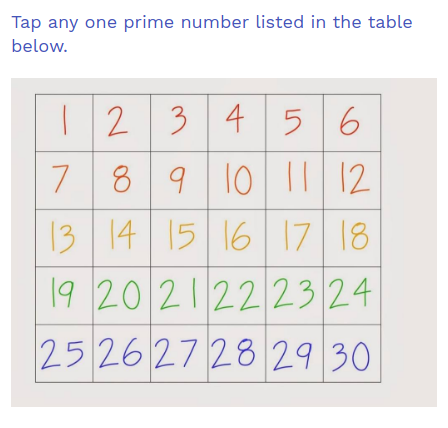 This question asks the student to tap on any of the prime numbers shown below. You can use the Tap an Image task to make interactive tasks such as this – just upload any image and then color in the correct answer(s). 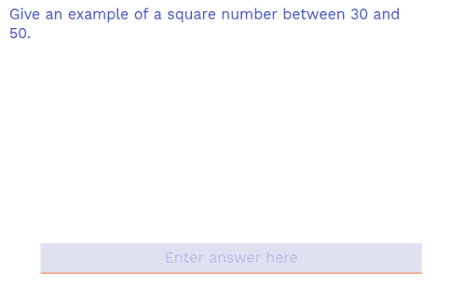 This problem asks students to find a square number between 30 and 50. Students can use the scratchpad and the expression editor to show their work. A fun follow-up question – how many square numbers are there between 30 and 50! This question is a great review of mathematical vocabulary. You can use this poll as a warm up, quiz, or even homework. Or, you can copy and then modify it to meet your needs. There are lots of excellent ideas to leverage for your classroom. With Woot Math, all of the polls are completely free and great Open Educational Resources (OER). Get started by previewing the poll right now, or login to wootmath.com and search for Prime Time Investigation in the Shared Gallery. Stay tuned for next week’s poll! 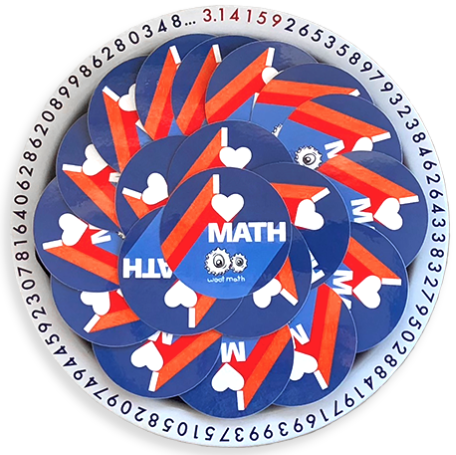 Pi Day celebrates the mathematical constant (π), as March 14 can also be expressed as 3.14, the first three digits of pi. Pi is the ratio of a circle’s circumference to its diameter, which is a constant. That is – for any size circle, the ratio is the same (π). The first large-scale celebration of Pi Day was organized by Larry Shaw at the San Francisco Exploratorium, where Shaw worked as a physicist. Then in March 2009, Pi Day became a national holiday in the United States. And a fun note? March 14th is also Albert Einstein’s birthday. Don’t worry, unlike Pi, this history lesson won’t go on forever. Onto the math! You can run any of these as a warm-up, quiz or even assign for homework. You can also copy and modify the questions and make them your own. There are lots of excellent ideas to leverage for your classroom. With Woot Math, all of the polls are completely free and a great Open Educational Resources (OER). Get started by clicking on any of the polls now to preview them, or login to wootmath.com and search by name. 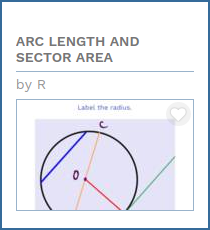 You can also click on the categories in the Shared Gallery – for example– Geometry, Trigonometry, to find more great resources for your classroom. And who knows, you might also have fun with pie charts, or even pumpkin pie. 1. No time pressure. Some of the recommended apps have the option of timing or the option of disabling the timer. I recommend disabling the timer in all cases. If you can’t disable or mellow out the timer, don’t use the app. 2. Conceptual modeling. There are plenty of apps that have flashcards embedded in sushi restaurants, caves, junkyards, etc. But I’m looking for programs that relate the concepts of the number and operations to the fact. This usually means some form of visual modeling (arrays, dots, etc.). 3. Productive handling of mistakes. They’re opportunities to learn and should be framed as such. Also, competition is to be avoided for most students. There are many ways I use Woot Math Adaptive Practice with my students. The Adaptive Practice provides a series of books by topic, covering all fraction standards. In sixth grade, we do an entire fraction unit, which I usually start by having them complete the Woot Math Fraction Refresher II unit. This book summarizes all the fifth grade standards, giving me the opportunity to quickly see my students strengths and weaknesses by reviewing the Woot Math Mastery by Topic report. From this report, I am able to immediately get easy to read insights into each student. The Woot Math Fraction Refresher unit acts as my pre-assessment. I then use the Interactive Problem Bank, provided with Adaptive Practice, to create lessons that cater to the topics that the report identifies my students struggle with the most. 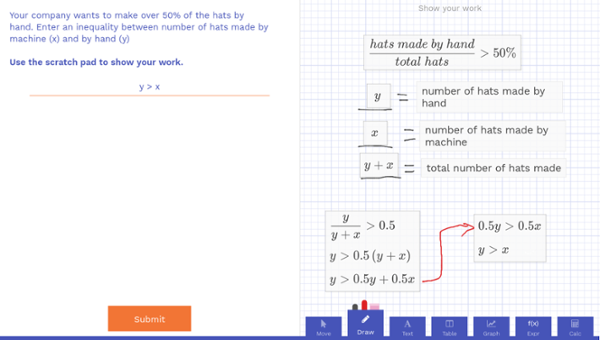 The Woot Math Interactive Problem Bank works well with SMARTboards, or can be projected on a whiteboard where students can write directly on the pictures, figures, and diagrams. These lessons meet the needs of visual learners with a variety of models including bars, circles, number lines and more. The lessons meet the needs of auditory learners as we all talk through a problem or process. Additionally, the lessons are hands on, and let students draw on and move shapes around to justify their reasoning. Here is a great example of how to use Adaptive Practice with the Interactive Problem Bank and Woot Math Polls. After my initial assessment, I then assign specific Adaptive Practice units to students based on their needs, including more advanced students who require a challenge. The smart software provides help and problems based on the way students answer, giving them appropriate practice. While students are working on Adaptive Practice in class, I have the time to meet one-on-one with students or in small groups to have in depth conversations about their understanding. I trust students to work on their device because they know I can see everything from my dashboard: screenshots of their work, how many problems they complete, and how much time it took them to complete each one. 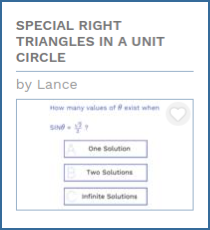 What I value most about Woot Math is that it perfectly supplements my curriculum and my teaching. The results speak for themselves: When my students use Woot Math they are more confident about math, and they are able to gain real mastery of the topics that they struggle with the most. Janelle Stanton is a full-time math teacher at Broomfield Heights Middle School. She has been a middle school math teacher for ten years. Before becoming a math teacher, she worked in corporate finance. She says that the experience she has had outside of education has supported learning in her classrooms because she can often answer the question, “When will we ever need to know this?” Teaching is her dream job, and she especially loves middle school because “the students are growing and changing in every way, and trying to figure out how to be their best selves.” She believes that middle school mathematics provides the foundation for many necessary real world skills, and is the parent of two middle schoolers. She loves to learn new things and considers herself a lifelong learner. She has presented at local and national math education conferences, e.g., the MidSchool Math National Conference: https://msm2017.sched.com/janelle.stanton. Janelle has a BA in Business Administration with an emphasis on Accounting and Finance, an MBA, and a Masters in Secondary Education with emphasis on Mathematics. This week's math poll asks students to convert between forms of linear equations and explain their preferred strategy for finding a line through two points or a slope and a point. This task has students convert the given equation into standard form. Encourage your students to use the scratchpad to show their thinking! The next task has students convert the given equation into slope intercept form. Encourage them to use the expression editor, which makes it easy to work with and manipulate equations. In the third task, students are asked to determine which equation they would use to find a line through the points (-5, -4) and (0,8). In this case students can choose from more than one answer – hence it is important to encourage them to show their work and strategy when solving the problem. In the fourth task, students are asked to find a line with a slope of 5 through the point (0,8). Again, multiple answers are possible – so students should explain their work. 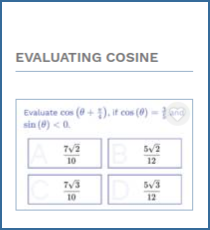 Get started by previewing the poll right now, or login to wootmath.com and search for the Algebra I Review poll in the Shared Gallery. We know many students struggle to master fractions, and yet until recently, we didn’t know the full extent of the cost. From recent research, it is clear that facility with fractions is critical to higher mathematics and other advanced STEM fields. Fractions: The new frontier for theories of numerical development. With a slew of similar findings, it is clear that knowledge of fractions matter. The National Math Panel said it clearly in 2008: “…knowledge of fractions is the most important foundational skill not developed among American students.” Lack of this foundational skill remains equally evident in recent national testing. And yet, imagine the difference it would make if you could ensure that all students had the fluency with rational numbers we know they need to succeed. Woot Math supports you in making this difference. 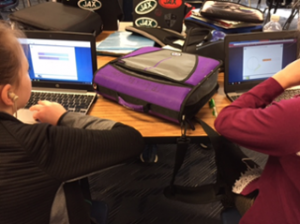 Teachers that use Woot Math report that it consistently increases both confidence and mastery of rational numbers. In only a few hours of use, teachers see measurable improvements in student performance. Here are a few specific ways that Woot Math’s personalized learning platform can help you ensure your students have the foundation they need to succeed. Woot Math Adaptive Practice is designed to support a range of implementations. You can assign topics as part of an in-class rotation, for 1-on-1 instruction, or for further practice. The learning platform interleaves short-form instructional videos with engaging interactive problems. An easy to use teacher dashboard is provided so that you can monitor each student‘s progress, report on outcomes, and assign new topics. Woot Math typically recommends two to four sessions per week, 20 to 30 minutes per session (learn more about our implementation guidelines for elementary school and middle school students). 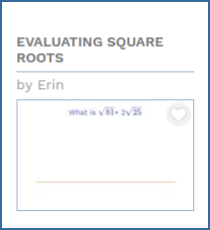 Woot Math leverages learning sciences’ leading research on teaching rational numbers. “Adaptive technology can only be effective if it leverages quality supplemental content,” says Krista Marks, Woot Math CEO in Fractions Unlocked: Why Fractions Matter and how technology can help. Our fraction content is informed by decades of research in fraction education from organizations like the Rational Number Project. With funding from the National Science Foundation, we have demonstrated efficacy and effectiveness using Woot Math. 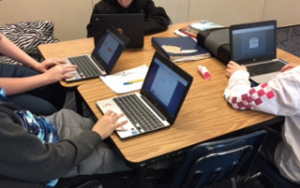 The promise of adaptive technology is the ability for software to tailor content to each individual student’s needs. But not all adaptive platforms (also known as personalized learning environments) adapt in the same way. In fact, there are huge variations in the adaptivity and recommendations that these systems can make. 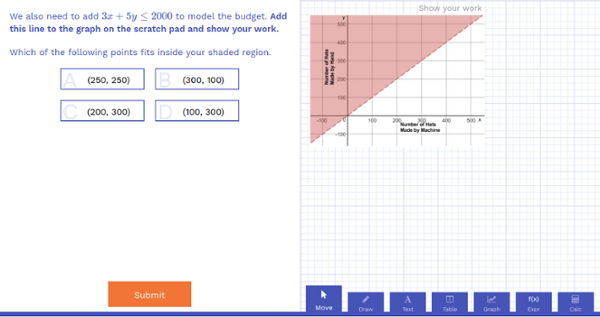 The Woot Math platform analyzes student work – not just a right or wrong answer – but their actual interactions with the models, manipulatives, and scratchpad. Because the adaptive platform understands the student’s interaction with each problem, it can make much more targeted decisions about what the student knows, what the student doesn’t know, and what gaps to help remediate. From our NSF-funded research, we know that our adaptive platform has shown dramatic improvements in student learning. Get your students started today! Dr. Terry Wyberg of the Rational Number Project provides tangible advice and practical tips for helping your students develop number sense in his article, Adding Fractions: Unlocking Confidence & Flexibility. PrevPreviousWould you like to unlock more free content in Adaptive Learning? 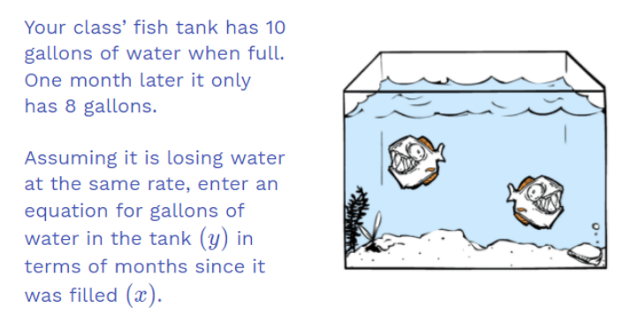 The first task presents a word problem with two data points, one where the tank has a full 10 gallons and one where it has 8 gallons a month later. The first task asks us to compute which car has a lower purchase price. In the scratchpad, I have pasted a picture of a table of values relating to lifetime cost and miles driven. 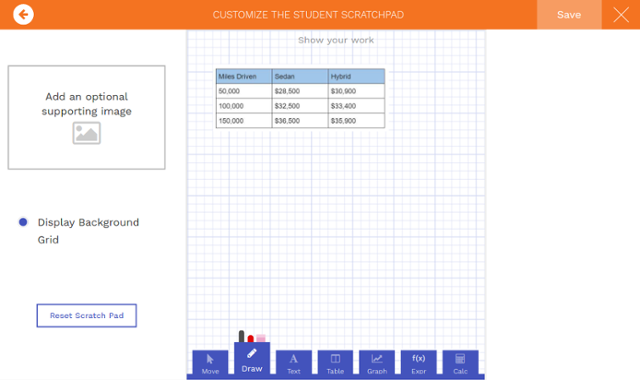 Students can draw on this table or use any of the scratchpad features to compute the cost at 0 miles driven. 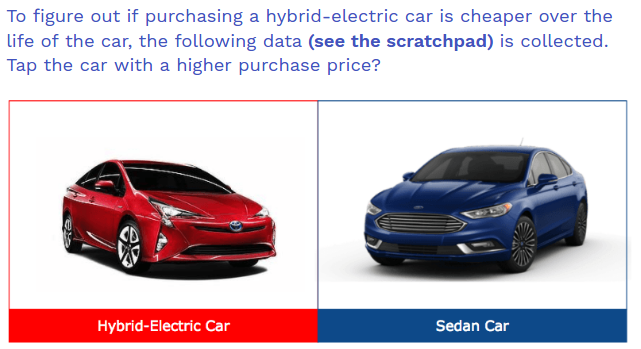 Since this problem asks students to figure out which car has a higher purchase price, students need to use the data to find how much the lifetime cost increases for every 50,000 miles and then work backwards to find the price at 0 miles. After students respond, I recommend displaying the results and then having a quick discussion to go over strategies and make sure they all were using a valid method. Students could get the right answer by just looking at the data for 50,000 miles instead computing it for 0 miles. 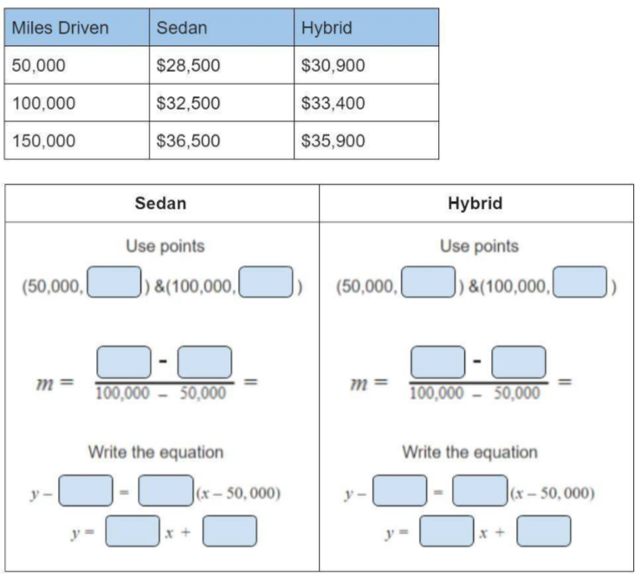 I recommend making sure that students see how to compute that the purchase price of the Hybrid was 28,400 and the purchase price of the Sedan was 24,500. This will be helpful for the next problem where students were asked to model each car with a linear equation. The scratchpad provides helpful support here in the form of a guided worksheet. Students can fill in the blank like they would in a workbook but now the answers are recorded digitally for you to analyze and organize. If you have students that want to solve it a different way or if they need more space, they can always move or delete the images. 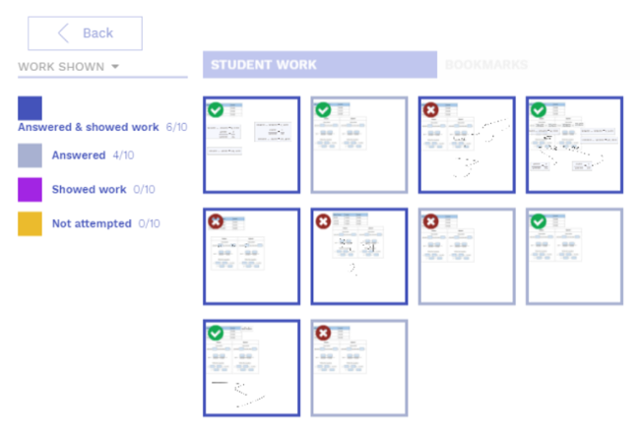 If you want use guided worksheets while making your own task, all you need to do is take a picture or scan of a worksheet and upload it in the scratchpad for your task. If you are worried that your students might not be filling out the worksheet and just peeking at their neighbor’s screen or using other unsanctioned resources, you can always sort responses by work shown. In the example below, four students did not show any work and two of them still got it right, suggesting it might be worth following up with them after class. For the students who got the task right and showed work, if any of them did a particularly nice job showing their work, you can pull up their response as an exemplar to show the class. You can even save it in the bookmarks (upper left) to show other classes in the future when you run this poll. Notice how this anonymous student used the text editor, the calculator feature and the drawing tool to show their work. The third and final task in this poll shows how we can use the scratchpad to hold more information like the answer to a previous problem that is used in a subsequent problem. For a teacher led poll, students will not see these equations until after everyone is done with task 2. Note that if you run this poll in student-led mode with the “students see results” set to never, students could go back on their own and change their response. This poll ends with a question asking them to self evaluate how confident they are in this material, this is a great way to check in and gauge your students while also giving them a valuable opportunity to self evaluate. This poll helps give some structure to modeling a linear relationship from a word problem and solving a system of linear equations. 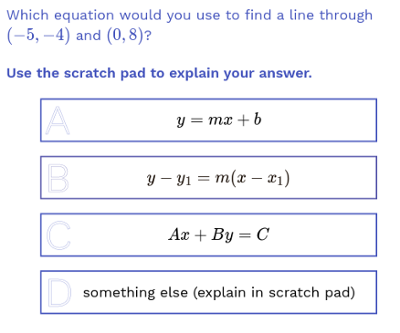 The scratchpad can help scaffold student work while also providing useful data for you on how they are working through each problem. This scratchpad feature turns polls turn into digital worksheets where students are guided through the intermediate steps. Stay tuned for next week’s math poll where we discuss some exciting new scratchpad features! As always, we encourage you to modify these tasks and content to align them with your instructional goals. Copy the poll, modify or delete any task, or add new tasks. Please reach out with any questions or comments, we’re here to support you! Get started by previewing the WootPoll right now, or login to wootmath.com and search for the Hybrid poll in the Shared Gallery. Some students will see the rate of -2 gallons per month and be able to translate that to the term -2x. Other students may struggle with how to get started. 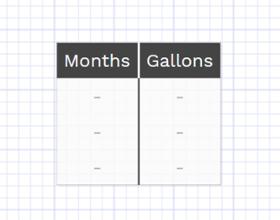 We encourage you to suggest they use the scratch pad to create a table of values for months and gallons. Then students can extrapolate what would happen after 2 months, 3 months, ect. If you think most students will need this support, you can go to scratchpad settings and add the table into the scratchpad so it will show up in every students’ scratch pad. 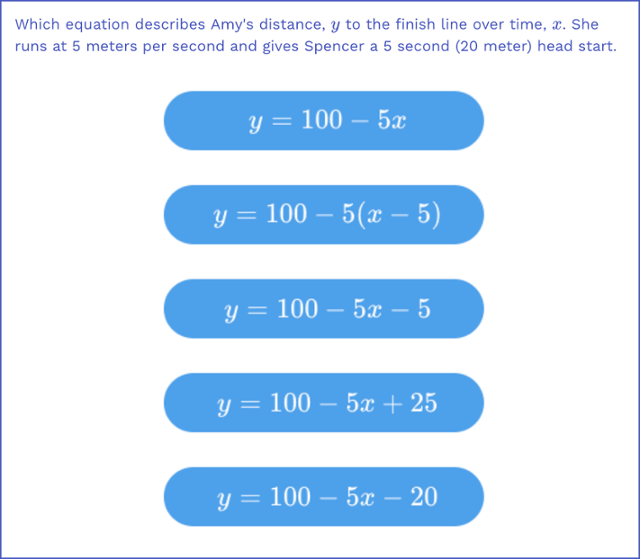 The custom legend for this task will also help you identify, among the students who did not get the question right, who is getting the correct slope, the correct intercept or forgetting the negative for the slope. This can help you give rapid feedback and recognize trends in your students’ errors. 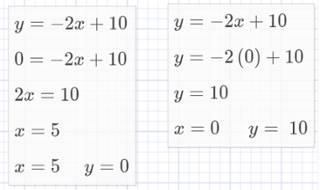 The second task asks students to fill in the blanks for the intercepts of y=-2x+10. If students are struggling to compute the intercepts analytically, you can have them use the scratch pad to create a table of values. When there is an expression on the right side header of the table, the table will auto compute the value of that expression. 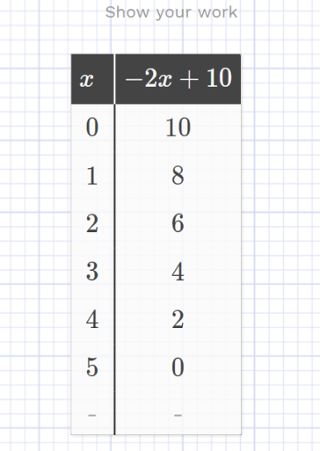 You can create a table that is placed in every student’s scratch pad so they can test points to see what -2x-10 equals for different values of x. In the example below, the values of -2x+10 are automatically computed based on the values of x that are entered. 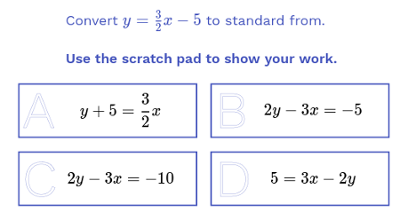 Students can also use the scratch pad to write out how they compute the x and y intercepts analytically. This can be a great reminder for students about showing their work. If students need more support, you can save the expression, written out with a header for y-intercept and x-intercept, directly on to their scratchpad. This can be a helpful reminder for your students and will help them keep their work organized. The final task asks the students to draw a line using the x- and y-intercepts. 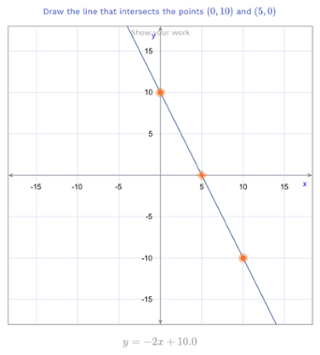 This task has an option enabled that displays the equation of the students’ graph as they manipulate the line. Students can see when they have the line matched up to the equation y=-2x+10. We encourage you to modify these tasks and content to align them with your instructional goals. Copy the poll, modify or delete any task, or add new tasks. Please reach out with any questions or comments, we’re here to support you! Get started by previewing the WootPoll right now, or login to wootmath.com and search for the Fish Tank poll in the Shared Gallery. PrevPreviousIs Adaptive Practice Free Tier Forever Free?